Covered call writing and put-selling calculations must be accurate and preferably understood by option-sellers. I created the Ellman Calculators to facilitate the authentic computations we depend on. In this article, I will review a successful trade executed by one of our members, David L, who used UTHR from our Premium Running list as the underlying security. This represented an excellent conservative position to take on one of our outstanding performers. The computations show a 5-week return of 2.57% with 2% downside protection of that profit (not breakeven). What is our real return, 2.57% or 3.9%? It’s 2.57%. To own the shares at $163.22 (current market value) we would have to buy back the option at $15.50. That would raise the real-life value of the shares from $150 (the option obligation) to $163.22 or + $13.22, leaving a net debit of $2.28 or 1.5%. This must be factored into our real-life returns. Rolling the option will also result in one less commission than closing the entire original position and re-opening at $163.22. When should the option be rolled? Next week. Dave had huge downside protection of his initial option profit and was fairly safe to max the returns from his original trade. Time value erosion of the option premium is logarithmic in nature, not linear, so the near term option time value will deteriorate faster than the next month option. It will be advantageous to us to wait closer to expiration to begin the rolling process. Congratulations to David on an outstanding trade. ***For a FREE copy of the Basic Ellman Calculator and its user guide click on the Free Resources” link on the top black bar of these web pages. For the week, the S&P 500 fell by 2.2% for a year to date return of 0.6%, including dividends. BCI: Cautiously bullish using an equal number of in-the-money and out-of-the-money strikes. I am inclined to be more conservative until we can view the market reaction to the first interest rate increase and market volatility levels off. Trade history for 1Q 2015, about $17K in profits using mostly shorting out of the money weekly put options. More recently been buying protective put options at lower strike prices on everything to limit the downside risk and sleep better. Your weekly lists save me a ton of time. Alan, is it prudent to always wait until close to expiration to roll out/up? Recently I’ve purchased several equities from the running list and sold OTM calls against them. Within the first week they are deep in the money. Are there factors to use to evaluate whether to hold or roll early in the month? It would seem there would be times when you might want to buy back the option and sell the stock to lock in a big gain, but maybe not. Thanks for the help! Excellent observation. When the price of a stock moves up significantly and early in the contract, an opportunity is created. As the strike moves deeper in-the-money, the time value component of the option premium approaches zero. This is known as the option trading at “parity” or all intrinsic value. In essence, we can close at virtually no cost (intrinsic value = amount of share appreciation above strike). Then the cash from closing can be used to establish a new covered call position and a second income stream. See pages 264 – 271 of the complete Encyclopedia…for details with examples. The Weekly Report for 03/27/15 has been uploaded to the Premium Member website and is available for download. 1. Is there an methodology to help decide which would be the best strategy for a given stock each month? 2. Does your weekly reports support both covered calls and cash secured puts strategies? 3. Which of your books or videos would you recommend to start with (I have a pretty basic understanding of options)? Looking forward to speaking with you in Charlotte. Please introduce yourself to me in Charlotte. 1- Both strategies can be successful in most market environments but I would give a slight edge to put-selling in bear market environments and covered call writing in normal to bull market environments. 2- YES. The stocks eligible for covered call writing are precisely the same stocks eligible for put-selling…ETFs as well. Covered Call Writing 4 DVD Series & Workbook (packaged with the Encyclopedia for a savings). It was great to see you both at the Traders Expo in NYC and have a chance to talk to you. I have a question about strike prices that I have noticed in certain option chains. The prices are not quoted in whole dollar or other typical increments. They end in .98. Recent examples are HEDJ and AAPL. Can you clarify? It was great to see you again and thank you for your family’s support over the years. In the case of HEDJ, it was a 1-time cash-dividend of $2.02 per share. When a dividend is distributed, share value declines by that amount so strikes are adjusted accordingly. In the case of the weird strikes shown in the April contracts for April, these appear to be residual contracts from the 7-for-1 split last year. I say that because nothing else has transpired to account for these strikes and if you multiply by 7 they come out to even strike amounts. My question is re AAPL & SWKS entered the S&P 500 last week. SWKS seemed to drop 12 points and AAPL can’t seem to gather momentum. Are funds required to buy these other than the index 500. SWKS again has recovered. I sold deep in the money 100 puts exp 4/17 I think the premium was 5.20 the stock was trading around 104 when I placed the order. I got out as soon as it dropped. Aside from that what is your take when an equity goes into the S&P 500? All S&P 500 index funds will be required to buy shares of these securities based on market capitalization. Some S&P 500 ETFs are based on equal weight requirements. This will represent a slight plus related to the buying requirements. The main advantage, in my view, is prestige…same when a stock is added to the DOW 30. It does also speak to the perceived quality of the corporation as well. I would not make any buy/sell option-selling decisions based on entry into the S&P 500 and continue to use the BCI screening criteria for those decisions. How big an account size is practical for doing the CC writing and Put selling in terms of being able to manage all the trades efficiently and effectively without becoming tied to the computer? I’m wondering if I should start self-managing a much higher percentage of my money than I currently do. Scaling is something that seems daunting to me. Can you tell me what your experience has been? There is no one right answer for this important question. It varies from investor to investor. I manage 15 – 20 positions in my option-selling portfolios plus another 3 – 5 ETFs in my mother’s account. This translates to 50 -100 contracts per month. This is my comfort level. It takes me 3 – 5 hours a month to manage using the Premium Stock and ETF Reports (I do no screening…leave that for my great team). We have members that have both smaller and larger portfolios than mine and manage quite well. I would start on the smaller side (keeping in mind appropriate diversification) and evaluate from there. You can always expand based on your experience. I am a firm believer in setting ourselves up for success so staying within our personal comfort levels is critical. Greg, when you scale up, there are two ways to do it. 1) You can increase the number of different positions you have. For example, it looks like Alan only does 2-4 contracts per ticker. This way you stay diversified and a problem with one or two positions doesn’t hurt too much. 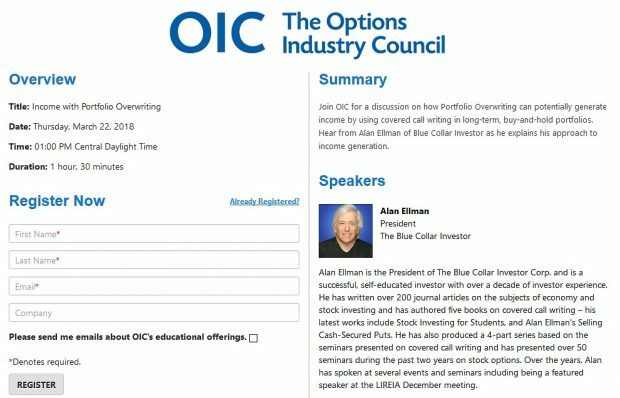 Alan can do 15-20 plus 3-5 ETFs in 3-5 hours per month. That many positions would take me more time than that every week. 2) The second way is to add contracts to fewer positions. Due to diversification risk, you almost have to go to ETFs and/or indexes with this approach. You get lower returns but you don’t have to follow and manage nearly as many different positions. In addition, the approach you choose might also affect the broker and the type of commission you use. With the ETF approach, you might decide to use a premium-priced broker like ThinkorSwim because the commission cost is manageable and you might use a per contract commission schedule. If you go with the large number of tickers, then you may need to switch to a discount broker like IB or eOption and/or go to a ticket charge + per contract commission rate. And last but not least, how detailed is your journaling? I think it’s important to capture every trade’s details and what happened and why. The more tickers you manage the longer it takes to record all the transactions for getting in and out. So net, it isn’t too surprising that if you take the higher time and effort approach you should get higher returns and the lower effort approach results in lower returns. When deciding whether to roll an option or allow assignment and use the cash for a different covered call position the following contract, we do NOT factor in the original option profit. In this case, prior to rolling we generated a 2.2% 1-month return and our shares are worth $150 due to our option obligation, not $163.22. Now we are faced with the decision to roll or not to roll. If we roll out and up to the next month’s $160 strike we end up with a net options debit of $600 ($1550 – $950). But because we raised to option ceiling from $150 to $160, our shares are worth $160 at that point in time, still not $163.22 but also not $150. That represents a credit of $1000.00. We must include this in our calculations because it was also part of the $1550 cost to close. The $400 represents the $600 option debit + the $1000 share appreciation credit. The 2% downside protection shown in the article represents the difference between $163.22 and the $160 strike. I write you because I would like to ask your opinion about combine selling covered call option approach with my long term strategy as stock owner. In my investment model I use to keep stocks in portfolio for at minimum one year. During that time I like to sell covered call options as a great way to gain extra cash flow every month. Naturally during a year my socks going up and down and some month I’m find my self in the situation when I need to roll out and up my options to protect the underline stock from be called away. The feeling is that I loose money every time I do this move. Didi I do something wrong? That I need to sell deeper out of the money to avoid to roll up to often? Or do you suggest a other approach? Thanks so much to help me with this issue. 1- Is a long-term commitment to an underlying security in the best interest for the strategy of covered call writing? 2- When you sell a call you are agreeing to sell at the strike and accept the fact that your shares cannot be worth more than the strike price as long as that option obligation remains. That said, by rolling out or rolling out and up at expiration you are paying intrinsic value (amount the strike is in-the-money) + time value. Assuming you are rolling very close to 4 PM ET on expiration Friday, that time value component will be very small (pennies/share). Therefore, the amount of share appreciation created by eliminating the near-term strike will compensate for the intrinsic value component, leaving you with a very small time value debit. For example, if you sold a $50 strike and shares moved to $60, the cost to buy back the near-term option may be $10.05. Once you buy back the option, your shares are no longer worth $50, they are worth $60, leaving you with a debit of $0.10 per share. Now you can write an out-of-the-money call on a stock currently worth $60. I go deeper OTM in bull markets. When portfolio overwriting, I want the strike to be at least 5% OTM for a 1-month contract. So this becomes a non-issue. I’d be more concerned about early exercise related to an ex-dividend date that is scheduled prior to contract expiration. The cost basis in the above rolling example should be $15,000, not $15,550 because at that point in time shares are worth only $150/share due to our option obligation. As a result the return is slightly higher as shown in the image below. Thanks to Gerry for catching this. CLICK ON IMAGE TO ENLARGE & USE BACK ARROW TO RETURN TO BLOG. After your presentation last weekend in Northern Virginia, I came away a bit confused about your approach to entering, exiting, and rolling? I’ve gone through your encyclopedia (in an encyclopedic research mode), but I have a question about a particular situation. When you have an option expire worthless because the stock declined, what do you use as a cost basis for the calculations of a new covered call position on that same stock? The original cost basis (which is now negative), or the price of the stock when you enter the new position? In the past, I have found that I am hesitant to sell calls on stocks that I have that are currently priced below their cost basis. Even though they are in tax-deferred accounts, I don’t like the idea of a potential exercise producing a loss to that stock down the road. I don’t consider these stocks to be what you call ‘portfolio overwrite’ stocks, but they do tend to stick around for several rounds of option sales. And, occasionally they get exercised because the get too deep in the money, or an ex-dividend date gets in the way. Although I didn’t go into detail about position management in the recent DC seminar, I’m happy to address this matter in this venue. 1- For tax purposes (capital gains/losses). In this scenario, cost basis is original price reduced by option premiums. These calculations should NOT influence trading decisions each month. You can use the Schedule D in the Elite version of the Ellman Calculator for long and short-term capital gains/losses and percentages. There are different scenarios for options exercised, expiring worthless or bought back. Check with your tax advisor as well. 2- Calculations on what to do at the current point in time (most important in my view). Original share price does not matter whether higher or lower. What matters is the price today. Here’s why: Assuming no tax issues, the stock does not matter. What matters is the cash we have invested in the stock. If we bought 100 shares of Company XYZ 3 months ago for $50 and now it’s trading at $45…we have $4500 invested in that stock. not $5000. The question is where to best place that $4500 to generate profit…in XYZ or in another equity. Had we bought XYZ for $40 and now it’s $45…we still have $4500 to invest and the same decision. We should never cloud our focus based on something that happened in the past but rather how best to shape the future. One we can’t control, the other we can. For these second set of calculations, we use the current market value. because that’s the amount we are about to invest. Since you are trading in a sheltered account exercise is a non-issue .In the rare instances when early assignment occurs, usually due to an ex-date which we can circumvent if we wanted to, we can always re-purchase the shares…no tax issue. But we shouldn’t want to hold onto the stock if the cash at hand will be better served in a better security. We are very close to adding a new trading tool that will monitor trading results during the course of a trade. It will be posted in the “resources/downloads” section of the member site. I hope you enjoyed my presentation last Saturday. Your answer pretty much confirms my thinking about the matter of costing. I guess I am still thinking of the performance of the option and the underlying stock as separate entities, when from your perspective, they really are not. Regarding the issue of exercise, my experience has been with times that an option has gotten so deep in the money that it is practically impossible to find and execute a roll strategy that does not generate a debit, something I have been hesitant to do. But again, a debit (even a total buy-back) is not necessarily a bad thing. One is simply transferring cash to equity, with the Net Liq. remaining the same. I may still have a simplistic view of this, but studying your methods is beginning to give me new insight on how I approach this. If there are no tax issues, I never have a problem letting a stock go if the calculations do not lead to my monthly initial time value goals (2-4% per month). As you astutely observed, when rolling a deep ITM option we are investing intrinsic value to increase our cash position in that equity. Is that where our cash will have the best opportunity to appreciate? If yes, roll the option. If no, goodbye old stock, hello new stock. I have no loyalty whatsoever to a stock. It took me a while to realize that it’s not the stock I care about but rather all that hard-earned cash I have invested in it that matters.